Very Good. 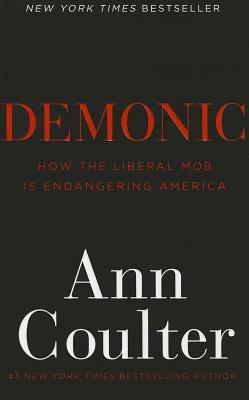 Demonic: How the Liberal Mob Is Endangering America by Coulter, Ann. Trade paperback (US). Glued binding. 354 p.
This paperback book shows normal wear and tear. This paperback book cover has stickers/sticker residue on it. Shipped to you from Goodwill of the Valleys, Roanoke VA. Thank you for your support! Very good. Soft cover book, very light wear to cover, pages are good and tight. Very Good. FAST SHIPPING. Great Service. As mobs of thugs and the lost try to take over public spaces in American cities, Ann tells how the Democratic Party has become the home for the mob mentality. Very timely. Thoroughly enjoyed the book, especially the comparison between the American and French Revolutions. Miss Coulter is an excellent writer who, unlike some others, researches and documents her works.